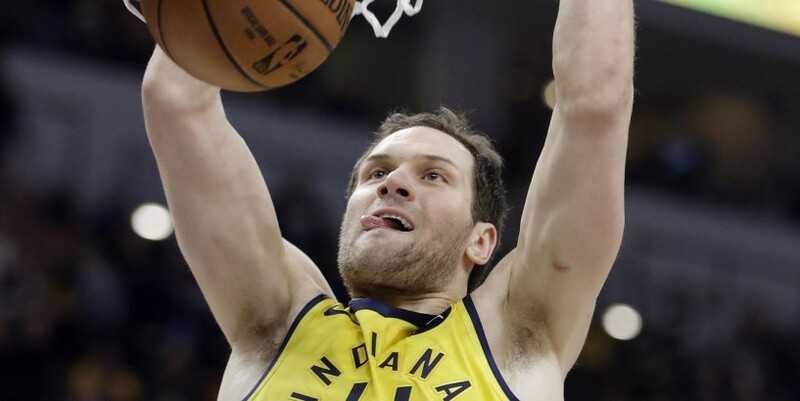 INDIANAPOLIS (AP) - Bojan Bogdanovic scored 23 points and the Indiana Pacers extended their winning streak to five games with a 105-90 victory over the Cleveland Cavaliers on Saturday night. Darren Collison added 18 points, Myles Turner had 14 points and eight rebounds and Domantas Sabonis came off the bench to score 13 points and grab 10 rebounds for the Pacers , who led by as many as 21 points. Bogdanovic and Turner shared the scoring load for Indiana to start the game, combining for 26 of the Pacers ‘ 54 first-half points. Turner started off the game scoring eight of the Pacers ‘ first 12 points, forcing Cleveland into an early timeout with back-to-back 3-pointers. Cavs: Channing Frye is seven rebounds away from reaching 4,000 for his careers. … The Cavs are 3-12 since Jan. 2. … Nance has recorded a double-double in five straight games. Pacers : For the third straight game, the Pacers scored at least 30 points in the first quarter. … Indiana is two wins away from tying its largest winning streak of the season at seven games. … Bogdanovic has scored in double figures in 32 straight games and scored 20 points or more in five of Indiana’s last six games. … Doug McDermott did not play due to bruised ribs. Pacers : Host the Hornets on Monday night.